We’ve often heard about or maybe even experienced a drop in clientele during winter. 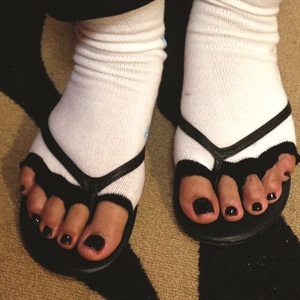 Perhaps it’s because pedicure regulars are now covering their toes with boots while others may not want to brave the cold climate to make it out to a salon. Whatever the case, we believe a winterized update to your menu, coupled with a little extra holiday cheer, might just do the trick to keep your clients coming back. NAILS spoke to nail techs across the country to find out what they’re doing to entice customers during this season. Here are nine ways to make winter work for you. 1. Start conversations early to book standing appointments. 2. Get creative with a seasonal signature service. Help your salon stand out by offering a seasonal pedicure or manicure service clients won’t be able to find anywhere else in town. 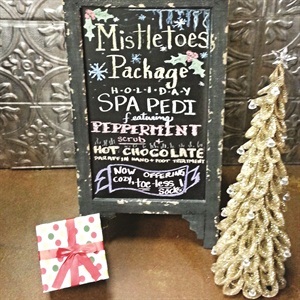 At Salon Legacy Nails in Rolla, Mo., Sarah Petersen offers a Toasted Sugar pedicure. “It is a warm blend of vanilla, brown sugar, and amber that creates a cozy and comforting scent. I am using a soft scrub for this pedicure. The beneficial ingredients in the lotion and scrub are shea, cocoa, jojoba butter, vitamin E, and aloe vera. I will put a scoop of epsom salt in the soak to ease the aches and pains and help the client relax,” she says. 3. Take a dip in paraffin wax while playing with essential oils in seasonal scents. 4. Add holiday-themed retail items. Be the odd man out among major retailers by offering professional festive products your clients can only get from you. Include a small selection of grab-and-go gift items to your retail section for some easy holiday shopping. “We offer holiday baggies in the shape of stockings, as well as CND cuticle oil, OPI’s apple spice lotion, and some holiday-colored polishes,” says Felicia Cruz of Hair Play Salon Spa in El Paso, Texas. 5. Lather up the ultra-hydrating products while sneaking a sale during services. Cold days bring more than rosy cheeks. Skin can get exceptionally dry and uncomfortable during winter causing skin to crack. Make sure you’re offering clients extra hydration and deep exfoliation. “I add Footlogix rough skin and heel formulas before adding lotion. Massaging those in helps bring back life and moisture to both hands and feet especially for clients that need extra repair,” says Lauren Hause of Hause of Nails in Round Rock, Texas. If selling retail intimidates you, add a small lotion or at-home kit to your seasonal service. “When you pitch the special service say it comes with a scrub or a lotion. Just make the price a little higher and get an easy sale,” says Rickette. 6. Show off holiday nail art. Create nail art in the spirit of the holidays and display it in a beautiful frame or on your own hands to lure unadventurous clients to try fun designs. If you’re having a hard time selling the add-on service, offer an accent nail for free to first-time clients. “Because I like to try different types of nail art, I offer 3-D art to my girls that let me go beyond the normal. In the past I’ve created a Christmas tree cork-screw nail and even a 3-D Santa. While I think 3-D art is beautiful, not all of my clients wear it. So I offer it as a free add-on to express my creativity and spread some holiday cheer,” says Eva Jenkins, a nail tech in Bellevue, Neb. 7. Keep clients’ feet warm. 8. Offer a snuggle buddy. Nail tech Michelle Whitaker, who also works at Salon Legacy Nails in Rolla, Mo., keeps clean blankets nearby for clients who get cold while at the salon. “I personally offer a signature peppermint and butter cookie pedicure and during those services I keep Snuggies for my clients to keep the chill of winter at bay,” she says. 9. Don’t forget to give thanks. The little things can go a long way with people. Show your clients some appreciation by giving them a handwritten thank you card and maybe a little something extra like an inexpensive candle or even a discount the next time they see you. “I am going to give the clients handmade holiday cards that have glitter sealed with gel-polish top coat so my clients don’t get showered in glitter. It’s a great way to say thank you and inside it will have a coupon for their next visit,” says Latoya Carver of Azia B’s Salon in Raleigh, N.C.